When I was a young, precocious child, I didn’t want to be a policeman nor a firefighter. I wanted to be a bullfighter, a matador! Part of growing up in Latin America, I would go to bullfights with friends and family and thoroughly enjoy the spectacle. And in my grandfather’s farm with young boys from the surrounding countryside, we would cape young calves ourselves. And so I learned a few lessons about bullfighting and fear. Now as a mindfulness practitioner, I have some observations regarding bullfighting, mindfulness, and fear. First, the bull’s and matador’s presence makes the spectacle. As mindfulness practitioners, the only prerequisite to be in the here and now is to breathe mindfully. By showing up to this precious moment, we make it alive. Second, in the end this spectacle is a fight for life. Contrary to popular belief, the bull doesn’t always die. In a mysterious manner, it is a Darwinian practice in selection of the fittest. The bull which charges through the cape and shows abundant bravery is spared and sires the next generation of pedigree fighting bulls. Those who vacillate, get distracted, or come short of their charge do not make worthy specimens for future generations. Mindfulness is a refining process in which only the best in us will bear fruit. There’s no half-hearted attempt. Then we also have to notice that there’s no room for cowardice in the arena. There’s no successful bullfighter who doesn’t acknowledge her/his fear. They know fear and face it squarely in the face. One can never be successful if one runs away from fear. 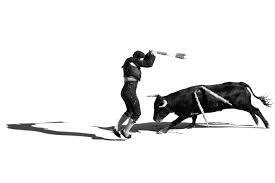 A matador faces death every single instance she or he faces the bull. In the face of fear and with an abundant jeering to egg him/her on, s/he follows through dexterously with each sweep of the cape. Any short sweep means that the bull has an opportunity to gore his opponent, the matador. Mindfulness asks us to be aware of our shortcomings and face them squarely on, we embrace and befriend them. And we live much more so by not being held back by these negative emotions. Mindfulness calls us to be present wherever we are with whatever baggage we carry, whether it is of an emotional, financial, and/or medical nature. Mindfulness practice requires us to be present wherever we are now. We don’t need a grand arena. This needs to be highlighted: wherever we are! This is the only great place to be. The other requirement is now, not later, or under ideal situations or with inspiring teachers. And the final prerequisite, just show up as we are. We are the best candidates for transformation. Mindfulness does not require us to have a certain pedigree, status, or perfection. It accepts us just as we are, nothing more, nothing less. Being open to the transformative power of mindfulness helps us to live fully. Although bullfighting has ceased to be a pastime for me, I believe there are applicable lessons. I look forward to seeing you this Thursday evening and sharing more about facing fear. What has been a defining fearful moment or situation and how did we react? How has our mindfulness practice helped us confront fearful moments? What have we learned tonight that we can apply to fearful situations? Below is an article by Thay. We all experience fear, but if we can look deeply into our fear, we will be able to free ourselves from its grip and touch joy. Fear keeps us focused on the past or worried about the future. If we can acknowledge our fear, we can realize that right now we are okay. Right now, today, we are still alive, and our bodies are working marvelously. Our eyes can still see the beautiful sky. Our ears can still hear the voices of our loved ones. The Buddha was a human being, and he also knew fear. But because he spent each day practicing mindfulness and looking closely at his fear, when confronted with the unknown, he was able to face it calmly and peacefully. There is a story about a time the Buddha was out walking and Angulimala, a notorious serial killer, came upon him. Angulimala shouted for the Buddha to stop, but the Buddha kept walking slowly and calmly. Angulimala caught up with him and demanded to know why he hadn’t stopped. The Buddha replied, “Angulimala, I stopped a long time ago. It is you who have not stopped.” He went on to explain, “I stopped committing acts that cause suffering to other living beings. All living beings want to live. All fear death. We must nurture a heart of compassion and protect the lives of all beings.” Startled, Angulimala asked to know more. By the end of the conversation, Angulimala vowed never again to commit violent acts and decided to become a monk. Invite your fear into consciousness, and smile through it; every time you smile so your fear, it would lose some of its strength. If you tried to run away from your pain, there is no way out. Only by looking deeply into the nature of your fears can you find a way out.